Devon Title believes that experience creates an environment where things get done accurately and efficiently. An environment where people can be aggressive, willing to do what it takes to help because they understand the business risks more fully. An environment where you can move forward with confidence, knowing your title search has been completed thoroughly and professionally. 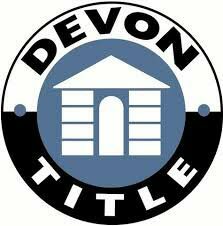 That is the kind of experience – and peace of mind – you’ll find at Devon Title. We’re constantly searching for new ways to serve our clients better, make their lives easier and provide real peace of mind. An attorney-based title insurance company providing quality service.